Be lucky. 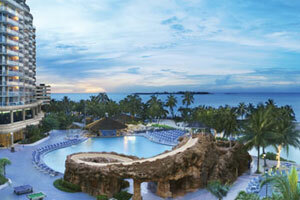 At the Wyndham Nassau Resort & Crystal Palace Casino, the sea meets the sun. And pleasure and convenience go hand in hand. Just outside your door are 1,000 feet of sugar-fine beaches and our own Vegas Style casino. We have the tallest tower on the Bahamas famed Cable Beach, offering the very finest views of the Carribean, the island and beyond. Take a dip in our private lagoon or oceanfront pool, complete with swim-up bar. Stay in one of our hotel's newly renovated rooms and suites with private balconies. Check out the spiral water slide and waterfall by day, and then see a show at night. We offer 8 spectacular restaurants and lounges, including the new all-you-can-eat buffet, SeaSide. After all the great food, you may want to visit our ocean-view fitness center. Then pamper yourself with a body polish or reflexology. If you must work, why not do it in the sun? We offer one of the largest conference facilities on the island. And we'd love to host any lucky couple's destination wedding outside or in our ballroom.